If you’re looking for somewhere a little quirky or even out of this world like the The Shire, look no further. 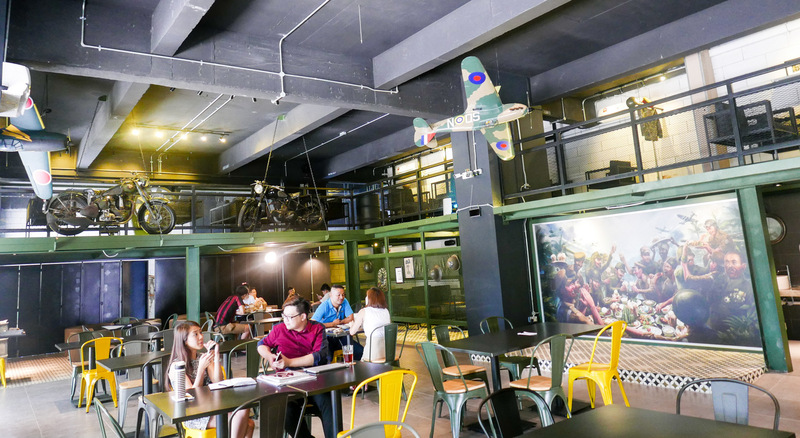 Whether go for bite to eat, to enjoy a drink from a chemistry flask, or even just to cuddle some cute animals, these eight themed and concept cafes are sure to offer you an experience that’s a little or a lot unusual. Cubs & Cups is dedicated to our favourite canine friends. A café whose motto is ‘Pets Welcome, People Tolerated’ offers a location for you to enjoy a bite to eat with your four-legged companion. Even if you don’t have you’re own fluffy friend to bring along, you can meet and mingle with the resident dogs. The Grumpy Cyclist fails to live up to the first half of its name: The team that steers this space is cheerful, not cranky, creating a welcoming eatery where pedal-powered patrons might feel particularly at home. Plenty of room within for folks to stow their bicycles and they even provide shower facilities so that sweaty riders can freshen up. Find: Contact details and map for The Grumpy Cyclist. The Chemistry Cafe + Lab, themed like a laboratory complete with measuring flasks, chemistry charts and lab coats, has been successful in experimenting with eccentric concepts and eclectic menus. A magnet for weekend crowds, this place buzzes with positive vibes, electrified by a bubbly team of staff members in lab coats. Sure, it’s gimmicky, but we won’t need a rocket scientist to tell us that wackiness can prove explosive. Caffeinated beverages with names like Bomb Chiller that come in lab flasks? Yep. Syringes filled with sugar syrup? OK.
Find: Contact details and map for Chemistry Cafe + Lab. It’s not easy to write about TOKB – on one hand, we believe its founders have pure intentions, striving to create a place that reflects on the lessons of World War II and honours the memory of those who suffered, fought or lost their lives. The menu spotlights flavours from Kelantan state (TOKB stands for Taste Of Kota Bharu, Kelantan’s capital), with northeastern recipes like laksam and nasi tumpang with serunding daging, ikan tongkol and ayam goreng sourced from a woman who’s cooked for three decades in Kelantan (the WWII connection lies in how Japan’s invasion of Malaya began in Kota Bharu). Find: Contacts details and maps for TOKB Cafe. Not all who wander in Sri Petaling are lost: The Shire Cafe proves as calm and cosy a retreat as its Middle-earth namesake. Spearheaded by a family of Lord Of The Rings enthusiasts – Tan and his two children – this new neighbourhood hideout is filled with fantasy flourishes that include walls touched up with a Tolkienesque map and a Hobbit’s home interior mural where customers can pose for Instagram shots while Howard Shore’s sweeping soundtrack from the movies plays on the speakers. Find: Contact details and map for The Shire Cafe. First, Dining In The Dark: thoughtfully crafted, multi-course mystery menus are served nightly (except Mondays) in a completely blackened hall by visually impaired wait staff whose calm, humor and concentration can put their sighted counterparts to shame. The belief that visual deprivation instantly heightens other senses, including taste, is debatable, though customers will probably pay more attention to their food here, devoid of distractions like cellphones and cameras (those will be placed in personal lockers outside the dining chamber). Find: Contact details and map for Dining in the Dark. Enviably photogenic, The Library Coffee Bar’s interior looks similar to that of a library, looking to lure the city’s legion of book-lovers and caffeine-lovers alike. As the sun sets, this place is transformed into the sort of urban sanctuary that’s not often found in shopping malls, surprisingly soothing and spacious. Find: Contact details and map for The Library Avenue K (as reviewed), The Library Bangsar South, The Library at The Curve, and The Library Midvalley.